In this post, we examined five of the best-selling chin-up bars. A chin-up bar or pull up bar is a device that can be attached to the wall, hung in a doorway, or is part of an exercise machine. It’s used for exercises that require users to pull themselves up with their arms, thus building upper body and back strength. If you want to skip to the punchline, the best-rated option we’ve seen is the no-frills Garren Fitness Locking Doorway Pullup Bar. Users say that it screws into the door jam with three screws and then the bar itself can be extended to the appropriate length. To use one of these devices, stand straight up with feet about shoulder-width apart. Grab the handles at each and pull yourself up so that your chin goes above the bar. Try to do a series of repetitions to build strength (Source). Chin ups are tough, especially for the beginner. Experts recommend losing weight and lifting to build muscle and strength before attempting your first chin up. Work on your back muscles first because that’s what’s going to help you do these exercises. (Source). We ran an in-depth analysis of the five- examining their primary differences. The Pure Fitness bar is a steel device made in the USA and is designed to fit most doorways from 27-32 inches wide. It has thick foam pads on the ends to prevent against marring your door frame. It also features six grip points and eight grip positions, which allow you to perform a variety of workouts. This equipment holds up to 250 pounds, and users said it’s easy to install and uninstall. The Garren Fitness pull up exerciser also fits into your door frame securely with mounts that are easy to install. This bar has a maximum weight capacity of 300 pounds. Unlike this previous model, this one is a straight bar that only allows traditional chin-up exercises. Foam grips help with comfort and ensure you won’t slip. If you’re looking for a solid, no-frills bar that’s reasonably priced, this is a good choice. Another straight chin up bar is the Sunny Health & Fitness. This also is a no-frills straight device that allows for only basic chin up exercises. It’s chrome plated, which looks great if you have a modern decor. It holds a maximum weight of 220 pounds. Like the previous models, this one also features comfortable foam grips; set up, and takedown can be done in seconds. Next up is the ProSource Multi-Grip, which is like the Pure Fitness model in that it has multiple (12) grip points for a variety of pull up exercises. This also fits standard door frames from 24-36 inches. It is designed to slip into the door frame with no mounting hardware, which makes takedown easy. The high-grade steel supports weight up to 300 pounds. The Iron Gym Total workout features a three grip portion bar, and it can be used for push-ups as well as crunches. This bar slips into the door frames between 24-32 inches without the need for mounting hardware. The durable steel holds up to 300 pounds. Some users, however, claimed the plastic bar that fits over the frame broke prematurely (Source). 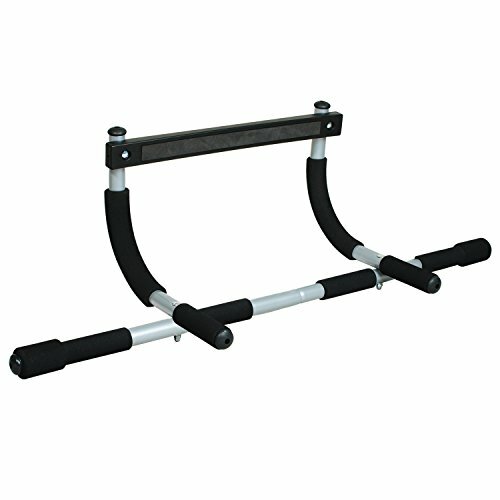 This upper body workout bar offered by Iron Gym is easy to install, well-made, and an excellent choice to keep fit. Users love the sturdy construction, but some do note that it doesn’t fit all doors. The Iron Gym upper body bar has three grip positions – narrow, wide, and neutral, and you can use it to do pull-ups, chin-ups, push-ups, dips, or crunches. Another great thing about this product is that you don’t need screws to install it, and it won’t damage your door. It’s suitable for 24″ to 32″-wide doorways with moldings/trims up to 3 ½” wide, and it will hold up to 300 lbs. As a whole, buyers are satisfied with the durability and usefulness of the Iron Gym chin-up bar, and they highly recommend it. A reviewer mentions that it took him around 10 minutes to install the product and that he has done over 600 pull-ups in two weeks with no problems. He adds that his door remains undamaged and that the rod holds his weight of 170 lbs. well. 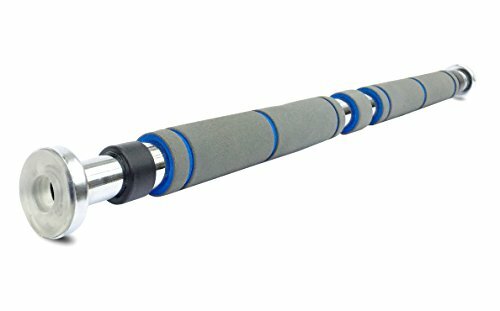 Another purchaser shares that he bought two fitness bars and that they seem well-made and durable, but he wouldn’t recommend them for someone over 200 lbs. A user also states that his sons use this exercise tool regularly and that they are happy with its quality. However, few customers have noted that they received the wrong hardware and that some parts are plastic. Some also complain that it damaged their doors. If you want to train at home and improve your upper body strength, you can try this multi-grip chin-up bar offered by ProSource. Users love the high-grade steel design, but some do note that the assembly instructions are poorly written. 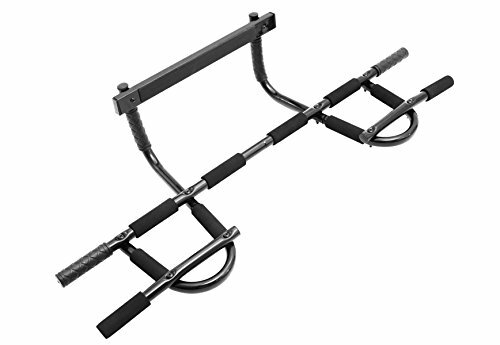 The ProSource chin-up bar has 12 comfortable grips so that you can do not only pull-ups and chin-ups, but also wide-angle close-grip and hammer grips, oblique curls, and leg raises. It fits standard door frames from 24” to 36” in width, and it can withstand up to 300lbs. Another great thing about this product is that the slip-in design allows quick installation. You can also mount it over the door with screws. A reviewer comments that over the door chin-bar is all metal and that there are no plastic parts. He adds that it’s one of the best pull-ups bars he has ever used and that he highly recommends it. Another user mentions that the product meets his expectations and that it can withstand 170 lbs with no bending. He adds that the extra grips are handy and that foam handles are a nice touch. A purchaser also states that mounting is not difficult, but he warns that it will leave black marks where the pads touch the door. However, a few customers have noted that the assembly is cumbersome because the holes are not drilled correctly. Some also warn that the product bends too quickly for their liking. This doorway pull-up bar offered by Sunny Health & Fitness is easy to store, light, and perfect for tough training sessions. Users love the price, but some do note that the screws are cheap. The Sunny Health doorway chin-up bar is made of sturdy chrome-plated steel, and you can adjust it from 24.5” to 36” according to your exercise preferences. Another great thing about this product is that it has paddled handles to reduce the risk of calluses in addition to non-slip grips for comfort. What’s more, this fitness tool can withstand up to 220 lbs., and you can use the weight bearing brackets for stability during workouts. A reviewer mentions that you need only a screwdriver to install the pull-up bar and that if you do it correctly, it won’t damage the frame. He adds that it’s one of the best doorway chin-up bars for home training. Another purchaser observes that it’s easy to switch positions and that the product fits his door well. He also comments that it stays in place when you tighten it firmly. A user also states that he is very impressed with the durability and sturdiness of the Sunny Health upper body exercise tool and that he highly recommends it. However, some customers have noted that their doors got damaged and that the quality of the tool is not what they expected. A few also complain that it’s dangerous to use and bend quickly. If you want to strengthen your back, arms, shoulders, and abs, you can take a look at this pull-up bar offered by Garren Fitness. Users love the high-quality constructions, but some do note that it comes loose in a couple of days. The Maximiza pull-up rod features heavy-duty chrome steel construction, which holds up to 300 lbs when installed properly and fits standard doorways (24 to 39). Another great thing about this tool is that it comes with two sets of heavy-duty door mounts and one set of medium-duty mounts. What’s more, it has non-slip foam grips, which is excellent because your hands will not get tired quickly. As a whole, reviewers have a high opinion of the Garren Fitness chin-up bars, and they praise the sturdiness, durability, and design.A buyer comments that the exercise rod arrived quickly and in excellent condition and that assembly takes no more than a few minutes. He adds that he is 170 lbs and 5’.7” and that he has been using it for weeks with no problems. Another purchaser shares that this is one of the best pull-up bars he has ever bought and that it’s a perfect fit for his doorway. A user also states that adjustment is a piece of cake and that it’s a solid piece of training equipment. However, a couple of customers have noted that the foam is cheap and that their doors got damaged during the mounting process. This training doorway bar offered by Pure Fitness is affordable, multi-functional, and suitable for standard doorways (27” to 36”) up to 6” in depth. Users love the eight different grip positions, but some do note that the screw holes were not drilled. The Pure Fitness doorway bar features heavy-duty steel construction with a weight capacity of 250 lbs, and six foam padded grips. Another great thing about this product is the non-slip rubberized feet, which protect your door from damage or markings. What’s more, it has a 90-day limited warranty, and it’s made in the USA. As a whole, buyers have a favorable opinion of the product, and they’re satisfied with the quality and performance. A reviewer comments that he had low expectations, but the chin-up bar turned out to be well-made and easy to install. He adds that it holds his weight of 175 lbs with no problems and that it feels solid and sturdy. Another user mentions that this is one of the best cheap chin-up bars he has ever used and that it’s perfect for complex workouts. A purchaser also observes that his door frame remains undamaged after weeks of exercises and that he highly recommends the Pure Fitness product. However, some customers note that the mounting is difficult and that the essential mounting hardware was missing. A few also state that it breaks quickly. There are various ways of using a chin up bars today in physical fitness. A chin up bar is a great way to stay in great shape. This equipment requires only a little space and is very effective since it is used to train all the muscles in the body. Chin up bars are being used by everyone because it is very inexpensive and it does the job. Proper Pullup form starts hanging on a pullup bar. Grip the bar shoulder-width apart with straight arms. Pull yourself up by pulling your elbows to the floor. Keep pulling until your chin passes the bar. Lower yourself all the way down until your arms are straight. Then pull yourself up again. The mechanism on how this works is very easy, the user just grabs hold of the bars with the arms about 12-18 inches apart. They slowly pull themselves up until their face has passed the bar, then gradually lowering themselves to the starting position. The frequency of doing the exercise will be the key determinant of an effective exercise. This exercise focuses on strengthening the back, however, when done repeatedly, the arms, chest, and the body may benefit as well. It’s really a matter of choice with regards to the pace you want to go because some trainers suggest going slow and others think a faster pace is better. You should know that the placement of the hands isn’t just for stability. 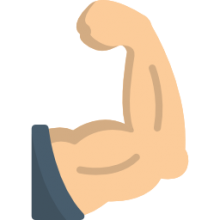 If you place your hands wider than your shoulders then the muscles that will get the most work out would be the outer edge of the back and under the arms. You can also target the lower body muscles such as the buttocks, stomach, and thigh just by adding variety to your exercise. One way to do it is by raising your knee to a 90-degree angle while pulling yourself up the bar. There are a lot of variations to this that’s why trainers love this equipment, as it is versatile to all the muscle groups in the body. When targeting the upper body to make it have a better shape, the following are tricks on how to use a chin up bar Lie on the floor and pull yourself up keeping your body rigid; your back is straight and you’re pulling up with your arms and shoulders. This technique forces you to use your deltoids and forearms. Each time you work out; do as many as possible to develop your arms, chest, and shoulders. Once you feel comfortable pulling yourself up 12 to 15 times, you are ready to do the full standing pull up. Re-position your pull up bar and get a chair to assist your initial practice. Position the pull-up bar at a level that needs you to jump up to grab it; hence, you will be hanging free. Hold the bar firm from your standing position or jump to grasp the bar depending on how your bar is positioned with your fingers facing you. For balance, ensure that your knees are bent cross your ankles. Then pull yourself up to have your chin in level with the bar. Therefore, adding the chin up bar exercise to your fitness regimen would be a great advantage to you. It is difficult to find an equipment that works out a lot of muscle groups in one go. It is very effective if you want to get that surfer’s body in no time.